The Giant Golden-Crowned Flying Fox is also known as the Golden-Capped Fruit Bat. 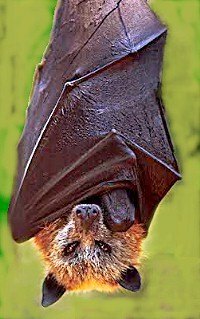 It is a rare fruit bat, and it is the largest bat in the world. It has a wingspan of about 1.5 metres (5 feet) and weighs up to 1.2 kilograms (2.5 lb). It is often seen wrapping itself with its large black wings like a black cloak. 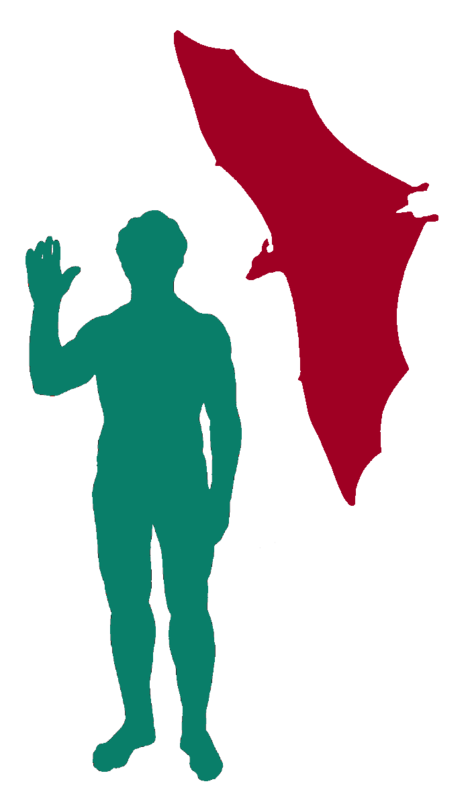 Unfortunately, this bat is endangered because of illegal hunting and forest destruction. It is native to the rainforests of the Philippines. It gets its name from the golden fur around the head. It is not related to the fox although its face looks a bit like a fox. It belongs to the megabats family. It has a black body and has no tail, just like any other fruit eating bats. It is active at night and can fly at least 40 kilometres (25 miles) in one night looking for food. It loves to eat figs, but if it cannot find any figs, it will look for other fruits to eat, such as puhutan, lamino and bankal. The Giant Golden-crowned Flying Fox is also known to be a silent planter because the seeds in their dung and the seeds which they spat on the ground while eating will take root and grow into new fruit trees. This helps to maintain the rainforest in the Philippines. The Giant Golden-crowned Flying Fox also helps to pollinate fruit trees. There are many fruit trees that depend on Giant Golden-crowned Flying Fox for pollination and seed spreading. Even its dung is a good fertilizer for the plants. The Giant Golden-crowned Flying Fox has two breeding seasons. The female will only become pregnant during one of the seasons. The mother will give birth to only one pup. This bat likes to wash itself often. It will use its black wings to scoop water up and pour it all over its body. They tend to rest in very large colonies so they can keep each other warm and safe from predators. The problem with big colonies is that it makes it easy for people to hunt them. Hunters will normally hunt them during the day when they are all resting. At the moment, this bat is endangered and it is almost extinct. It has disappeared from many smaller islands and some larger islands in the Philippines, like Panay and Cebu. It is also hunted for its meat in some areas. When the fruits are taken away by humans, these bats will have no food to eat and they may even die of starvation. There are people working hard to make sure the Giant Golden-crowned Flying Fox does not go extinct. The Subic Bay region of the Philippines has been established as a place to do research on these bats and protect them. Do any other animals hunt the Giant Golden-crowned Flying Fox? The main predators are, alas, people. It’s an endangered species, because of poaching and the destruction of its habitat (the places it lives).